A snow summit east of Garibaldi Lake, on the divide between the Sphinx Glacier and Cheakamus Glacier. Mount Carr is a popular 2 day ski ascent during winter and spring when Garibaldi Lake is frozen. Access is usually via the Garibaldi Lake Trail and skiing across Garibaldi Lake to the Burton Hut. 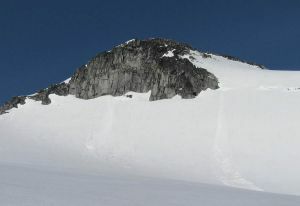 From Burton Hut, ski up the Sphinx Glacier to the west side of Mount Carr. Gain either the south or north ridge, and follow either ridge to the summit. There are also technical rock routes on the short west face. Name Notes: "Mount Carr", not "Copper Peak" was adopted September 2, 1930 on the Garibaldi Park map. It's named after Frank Edward Carr, a Vancouver post office clerk and BC Mountaineering Club executive member, who served with the 7th Battalion, Canadian Expeditionary Forces in Canada, England and France in the Great War, and was killed in action in France 26 April 1915. Carr was born at Ryde, Victoria County, Ontario, 19 December 1886.